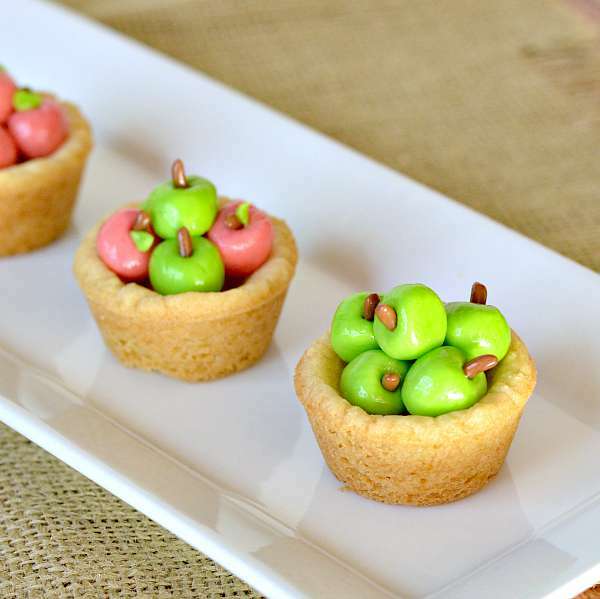 Apple basket sugar cookie cups are the perfect treat for fall. Not only are they easy to make but they are adorable fall decor for your kitchen. I love fall and I love apple season. Growing up in Michigan, trips to cider mills and apple picking were always a fall must do activity. Nevada doesn't exactly have cider mills, though, so I have make my own fun. Having these little apple baskets sitting on the counter reminds me that it really is fall despite the 100 degrees outside. The best part is that every apple is different in nature, so you shouldn't worry too much about each apple looking the same. Have fun with it! You can do all green, or all red, or mix it up with green and red apples or maybe even yellow for Golden Delicious apples. Start by making the sugar cookie cups. You will need a mini muffin pan to create the cups. It's also helpful to have a tart shaper although the back of a tablespoon would also work. Once they are baked, set the sugar cookie cups aside to cool completely. Now, it's time to make the apples. 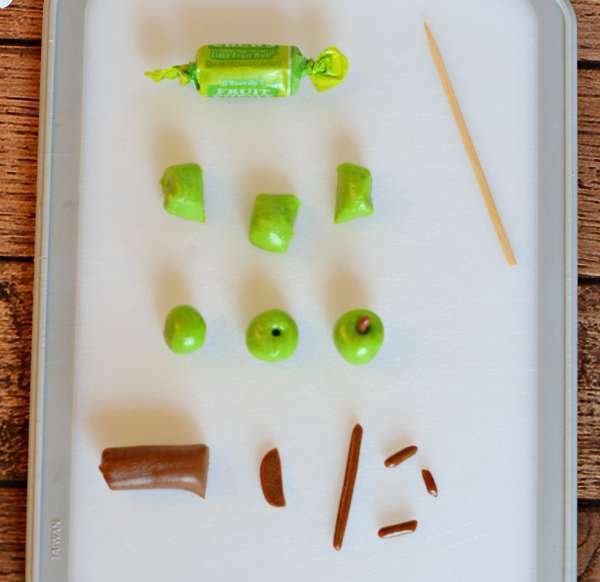 You can make three apples per Tootsie Roll and will need at least one extra green for the leaves. Unwrap the ends of each Tootsie Roll, but leave the candy in the wrapper. Microwave 2-3 Tootsie Rolls at a time for about 5-10 seconds in the wrapper. 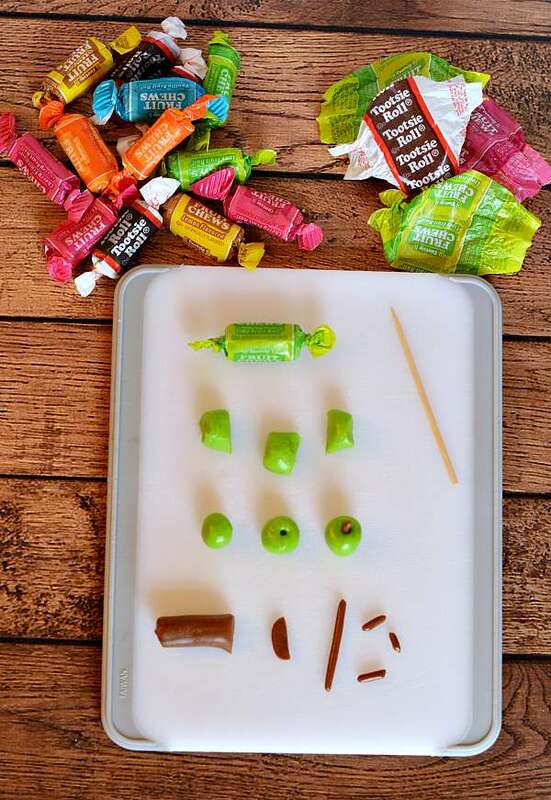 Using a cutting board and sharp knife, cut a green or pink tootsie roll into three pieces. Roll each piece into a round shape. Set aside. Cut the snake to make a small stem. Insert a toothpick into the round apple and place the chocolate stem inside. Flatten a small piece of green tootsie roll and cut a tiny triangle leaf. Place in prepared, and completely cooled, sugar cookie cups. The cookies last well when displayed but if you plan to serve them, then I'd store in an air tight container. They've lasted for at least 4 days sitting out on the counter and still looked perfect. 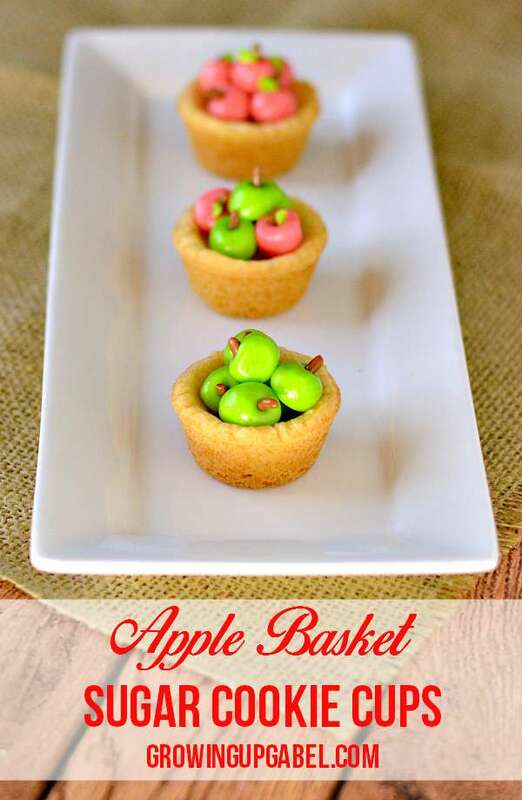 Spice up your kitchen this fall with these fun apple baskets! 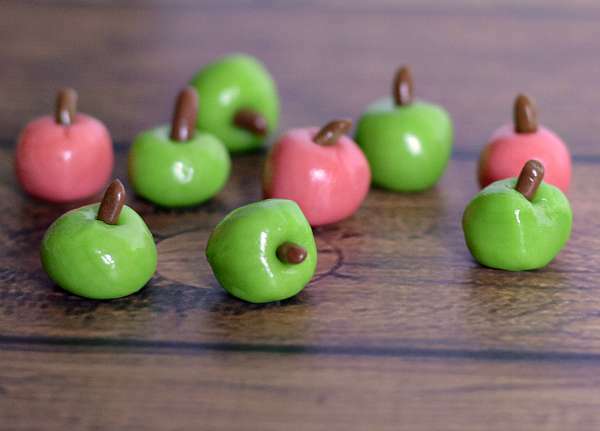 You can create three apples from one green or pink tootsie roll. You'll need a least 1 extra green for the leaves. Heat oven to 350. 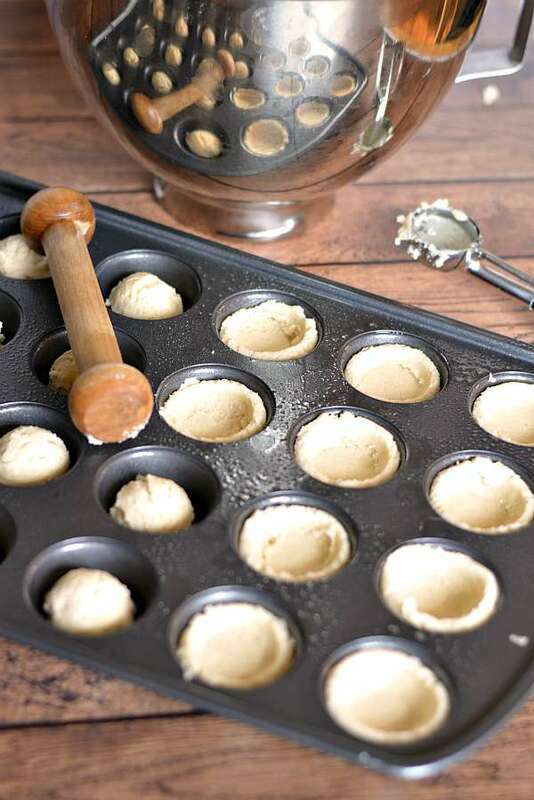 Grease mini muffin pan. Beat sugar and butter with a mixer until light and fluffy, about 3 minutes. Scrape the bowl sides at least once during mixing. Beat in egg and vanilla. Slowly add flour to mixture and mix until blended. Roll into 1" balls, place in muffin tin and using a pastry tart shaper, push into tins. If you don't have a tart shaper, you can use the back of a "half circle" tablespoon. Bake 8-10 minutes until golden brown. These freeze really well. Microwave 2-3 red and green fruit Tootsie Rolls for about 5-10 seconds in the wrapper. I usually unwrap the ends before I microwave them, but I leave the candy in the wrapper. Cut a small piece of a chocolate tootsie roll and roll into a "snake." Cut the snake to make a small stem. Insert a toothpick into the round apple and place the chocolate stem inside. Flatten a small piece of green tootsie roll and cut a tiny triangle leaf. Attach to stem. Place in prepared, and completely cooled, sugar cookie cups and enjoy! 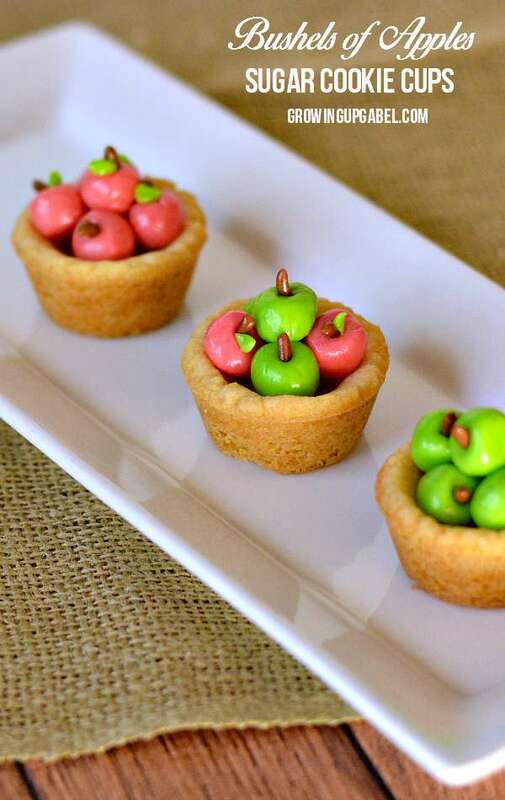 I just pinned your awesome Apple Basket Sugar Cookie Cups, what a special treat!! Thanks so much for sharing with us at Full Plate Thursday. Have a great weekend and come back to see us real soon! These cookies are s stinin’ cute! Great idea and I didn’t know tootsie rolls come in colors. So easy to make and a great treat for the kids (I stay away from chewy candies – last time a filling came lose). Thanks for sharing with Fiesta Friday. P.S. I’ve lived in Michigan most of my adult life and love it here. What a cute idea and they look gorgeous and tasty! 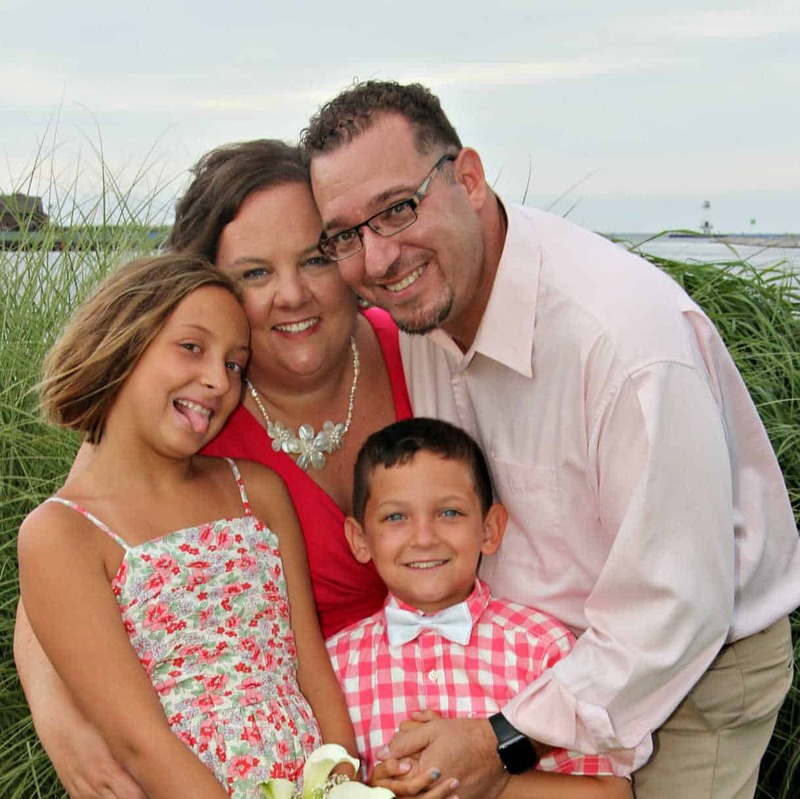 Thanks for sharing at #overthemoon link party this week. These are so adorable!! What a fabulous idea! Oh my goodness! These are absolutely darling. They are almost too cute to eat. Thanks for sharing. These are absolutely adorable!!! I can’t wait to make these this weekend with my daughter. Thank you so much for sharing. Awesome!! Those look so cute and I bet they taste delicious!!! 😉 WOW! 😉 Thank you for this wonderful inspiration! Have a nice week! I fell in love with your recipe the moment I saw it – SO creative! Too cute! 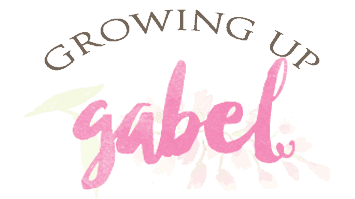 Making those little apples will be like playing with playdoh! Brilliant!!!! These are the cutest things everrrrrr. Now those cookies look too adorable to eat, but I’m sure they are fabulous! Thanks for sharing. I have definitely pinned for later. Those are just the cutest! What a clever idea. I will have to make these with my youngest daughter. Oh my gosh this is the cutest thing ever! I shared it on my Facebook page! STOP.IT. Oh my gosh, I can’t handle the cuteness!!!! Pinned this one for sure. 🙂 So glad you linked up at Snickerdoodle Sunday and hope to see your latest & greatest this weekend! Those are the cutest thing ever! 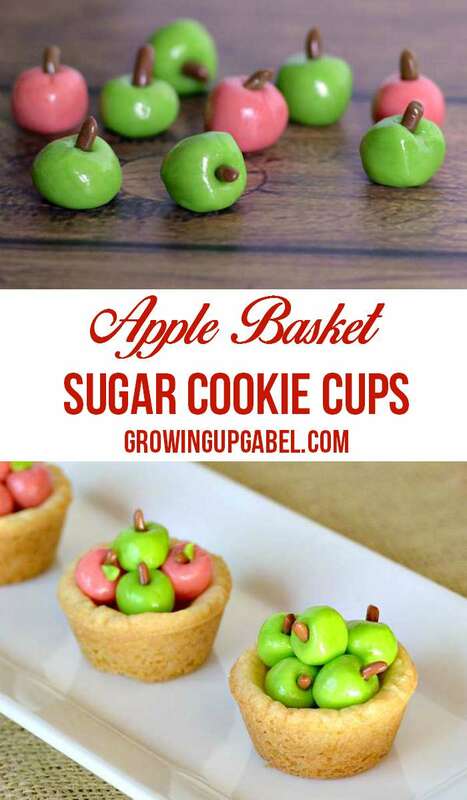 I am throwing an apple shower next month and these would be perfect. I am not sure I have the patience to make all those little apples though!